A four-story building at the Tripoli compound of Libyan leader Moammar Gadhafi was damaged Sunday night, apparently by a coalition airstrike. The latest developments on the situation in Libya, where coalition forces launched a series of coordinated airstrikes on Saturday after they were convinced Libyan leader Moammar Gadhafi was not adhering to a cease-fire mandated by the United Nations. Read our complete story and check out our full coverage on unrest in the Arab world. Also, don't miss a gripping, high-resolution gallery of images from Libya. [10:51 p.m. Sunday ET, 4:51 a.m. Monday in Libya] An announced list of the countries participating in the military coalition: The United States, Belgium, Britain, Canada, Denmark, France, Italy, Norway, Qatar and Spain. U.S. officials have said they plan to hand over operational control of the military mission in coming days. [8:36 p.m. Sunday ET, 2:36 a.m. Monday in Libya] A coalition military official has confirmed that Libyan leader Moammar Gadhafi's compound in Tripoli was targeted by airstrikes Sunday night, CNN's Chris Lawrence reported. The official said the compound was targeted because it contains capabilities to exercise command and control over Libyan forces and the coalition goal is to degrade his military capabilities. The official said neither Gadhafi nor his residence was the intended target. 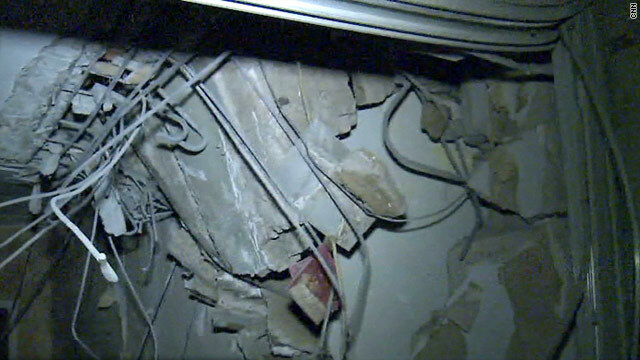 Earlier, the Libyan government said at least one missile struck a building inside the compound Sunday night. Western journalists, including CNN's Nic Robertson, were brought inside the compound to survey the destruction. [8:26 p.m. Sunday ET, 2:26 a.m. Monday in Libya] Oil prices jumped more than $2 a barrel in electronic trading Sunday following escalating violence in Libya, where international forces fired on Libyan defense sites, CNNMoney reported. The benchmark U.S. contract, West Texas Intermediate, for April delivery gained $1.95 to $103.02 a barrel. The more active May contract jumped $2.08 to $103.93 a barrel. [8:10 p.m. Sunday ET, 2:10 a.m. Monday in Libya] The Gadhafi-compound building in Tripoli that was damaged in what may have been a missile attack Sunday night is about 150 yards away from a Gadhafi building that was struck in a 1986 U.S. airstrike, CNN's Nic Robertson reported. [7:56 p.m. Sunday ET, 1:56 a.m. Monday in Libya] A member of the Libyan opposition told CNN that the Gadhafi government collected bodies of people killed in fighting in the past week and displayed them over the weekend, trying to show they were killed by coalition airstrikes. The claim by Ahmed Gebreel, who cited eyewitnesses and medical officials, could not be verified by CNN. The Libyan government has claimed that women, children and clerics have died in allied attacks. [7:15 p.m. Sunday ET, 1:15 a.m. Monday in Libya] A building at Libyan leader Moammar Gadhafi's compound in Tripoli was damaged by at least one missile about 2.5 hours ago, a Libyan government official tells CNN's Nic Robertson. Robertson said government officials took him to the four-story building. The roof has collapsed, he said. Robertson said he isn't able to verify what caused the damage, but the government's timeline coincides with a blast that Robertson heard late Sunday, and the building looks as if it were hit by missiles, Robertson reported. Robertson said he doesn't know where Gadhafi is, and that there is no evidence that he is at the compound. No one was injured in the strike on the building, a Libyan government official told Robertson. U.S. officials earlier Sunday said they are not targeting Gadhafi. [6:36 p.m. Sunday ET, 12:36 a.m. Monday in Libya] President Obama and his national security team made phone calls Sunday to try to shore up support in Arab governments for the military mission in Libya, with top White House aides reaching out to officials of the Arab League to insist the bombing does not exceed the scope of a U.N. mandate, according to senior administration officials. The lobbying came after Arab League officials complained earlier Sunday that airstrikes in Libya by the U.S. military and allies went beyond instituting a no-fly zone, CNN's Ed Henry reports. The senior officials said the Obama team stressed to the Arab League that bombing Libyan leader Moammar Gadhafi's air defenses falls within the U.N. Security Council resolution's scope of imposing a no-fly zone and taking "all necessary measures" to stop the dictator from attacking civilians in his own country. [5:57 p.m. Sunday ET, 11:57 p.m. in Libya] Defense Secretary Robert Gates said Sunday that the Libyan operation is off to a "a strong and successful start" but he warned against widening the goals of the mission beyond what was spelled out in the United Nations Security Council resolution. Gates spoke from aboard a U.S. military aircraft en route to Russia. [5:40 p.m. Sunday ET, 11:40 p.m. in Libya] Reacting to the Libyan military's calling a cease-fire with rebels, a British prime minister's office spokesman drew attention to the Libyan government's previous call for a cease-fire, made Friday. "Everyone will recall that in recent days Col. Gadhafi declared a ceasefire which was promptly violated," the 10 Downing Street spokesman said. "We said then we would judge him on his actions not his words - and we will do so again. "His obligations are very clearly set out by the U.N. Security Council resolution. Our assessment is that he is in breach of these obligations so we will continue to enforce the resolution." The Libyan government had called for a cease-fire with rebels on Friday. Rebels and Western governments, however, said the Libyan military continued to fight against the opposition, leading to the international coalition's airstrikes and no-fly-zone implementation on Saturday night. [5:35 p.m. Sunday ET, 11:35 p.m. in Libya] More on U.S. Vice Adm. Bill Gortney comments on Gadhafi: Gortney was asked about reports of smoking rise from the area of Gadhafi's palace. Gortney said: "We are not targeting his residence." [5:16 p.m. Sunday ET, 11:16 p.m. in Libya] In his press briefing earlier this afternoon, U.S. Vice Adm. Bill Gortney emphasized that the international coalition's air campaign is not deisgned to target Gadhafi, but is limited to enforcing a no-fly zone and preventing Gadhafi's forces from further pressing rebel positions. "We are not going after Gadhafi," Gortney said at the Pentagon. "Regime forces are more pressed and less free to maneuver." Despite Libyan government contentions that women, children and clerics have died in allied attacks, Gortney and other officials said that's not the case. "We have no indication of any civilian casualties," the admiral said. [4:47 p.m. Sunday ET, 10:47 p.m. in Libya] Reacting to the Libyan military's call Sunday night for an immediate cease-fire, a spokesman for the U.S. military's Africa Command said that "we have to wait and see if it's genuine." "We urge the Libyan government to do everything it can to demonstrate its sincerity," U.S. Africa Command spokesman Vince Crawley told CNN. The Libyan government previously had called for a cease-fire with rebels on Friday. Rebels and Western governments, however, said the Libyan military continued to fight against the opposition, leading to the international coalition's airstrikes and no-fly-zone implementation on Saturday night. Gadhafi's forces shelled opposition forces in the west of the country on Sunday before the call for the cease-fire was made, according to rebels. [4:42 p.m. Sunday ET, 10:42 p.m. in Libya] Anti-Gadhafi forces are heartened by international coalition attacks that smashed a convoy of about 70 military vehicles belonging to pro-Gadhafi forces outside of Benghazi on Sunday. But they are increasingly concerned that pro-government elements within Benghazi's population will carry out intimidation campaigns and targeted assassinations of opposition leaders in the rebel stronghold in eastern Libya, CNN's Arwa Damon reports. [4:34 p.m. Sunday ET, 10:34 p.m. in Libya] Senator Richard Lugar, R-Indiana, has questioned the decision by the United States to pursue military action in Libya without clearly defined objectives, and expressed concern over the role of the U.S. in Libya's future. "Where does our involvement stop?" Lugar, the ranking Republican on the Senate Foreign Relations Committee, asked. "This is why, before it begins, we ought to have a plan and we ought to have outcomes defined as to why American forces, American money are going to be at stake." [4:23 p.m. Sunday ET, 10:23 p.m. in Libya] U.S. House Speaker John Boehner has released a sharply worded statement in Washington pressing President Barack Obama to lay out more detail about the administration's goals in Libya. "Before any further military commitments are made, the administration must do a better job of communicating to the American people and to Congress about our mission in Libya and how it will be achieved," Boehner said in the prepared statement. Shortly after Boehner's statement was released, Obama - who is in Brazil - said in a speech that the people of Libya have taken "a courageous stand against a regime determined to brutalize its own citizens." "Across the region, we have seen young people rise up – a new generation demanding the right to determine their own future," added Obama. "From the beginning, we have made clear that the change they seek must be driven by their own people." [4:08 p.m. Sunday ET, 10:08 p.m. in Libya] At least two explosions could be heard moments ago in Libya's capital, and anti-aircraft fire has followed, CNN's Nic Robertson reported. [4:06 p.m. Sunday ET, 10:06 p.m. in Libya] Coalition strikes have been "very effective in significantly degrading the regime's air defense capability," U.S Vice Adm. William Gortney said in a briefing Sunday. [3:37 p.m. Sunday ET, 9:37 p.m. in Libya] The United States and Britain have now fired a total of 124 Tomahawk missiles at Libya's air defense sites since strikes began Saturday night, Africa Command spokesman Vince Crawley says. [3:04 p.m. Sunday ET, 9:04 p.m. in Libya] The Libyan military has called for an immediate cease-fire, an army spokesman announced Sunday. [2:27 p.m. Sunday ET, 8:27 p.m. in Libya] Libya initiated anti-aircraft fire into the Tripoli sky Sunday night, though an attack by allied forces was not apparent, CNN's Nic Robertson reported. [2:04 p.m. Sunday ET, 8:05 p.m. in Libya] A senior doctor at the medical center in Benghazi, Libya, confirmed Sunday that 95 people were killed and an unknown number injured in Saturday's assault on the city by pro-Gadhafi forces. [1:53 p.m. Sunday ET, 7:53 p.m. in Libya] U.S. President Barack Obama participated in a secure conference call and received a briefing on U.S. military operations in Libya on Sunday morning, the White House said in a statement. [1:34 p.m. Sunday ET, 7:24 p.m. in Libya] The Arab League was holding an emergency session at its headquarters in Cairo, Egypt. Hisham Youssef, Arab League Chief of Staff, told CNN, "We are currently studying the situation and evaluating the air strikes to be able to decide." He said the League has not "taken any stand or reached a final decision." Read more about the Arab League and its role in the Libyan crisis. Watch CNN's Reza Sayah discuss the Arab League. [1:15 p.m. Sunday ET, 7 p.m. in Libya] Qatar has offered to send four fighter planes to the coalition effort, the French Defense Ministry said. [11:45 a.m. Sunday ET, 5:45 p.m. in Libya] Italy announced that as of midnight Sunday, four Tornado warplanes and four F-16s will be made available. [11:00 a.m. Sunday ET, 5 p.m. in Libya] A critique of the U.S. involvement in the military intervention in Libya that will no doubt be common in coming days is that the Obama administration is making a large error by embarking on a war with a third Muslim country, as if reversing Moammar Gadhafi's momentum against the rebels will be a rerun of the debacle of the war against Saddam Hussein. Peter Bergen explains why what's happening Libya isn't the same as what happened in Iraq. [10:45 a.m. Sunday ET, 4:45 p.m. in Libya] Russia urged coalition nations to stop the use of force against Libya, challenging the use of the U.N. no-fly zone resolution as a "controversial step." In a statement published on its website, Russia's Foreign Ministry said air strikes carried out by coalition forces killed 48 civilians and injured 150. [8:23 a.m. Sunday ET, 2:23 p.m. in Libya] A military convoy near Benghazi in eastern Libya was destroyed by multiple airstrikes, leaving charred bodies, tanks and trucks, CNN's Arwa Damon reported from the scene. - A no-fly zone in Libya is "effectively in place," U.S. Joint Chiefs of Staff Chairman Adm. Mike Mullen told CNN. [6:53 a.m. Sunday ET, 12:53 p.m. in Libya] Forces loyal to Libyan leader Moammar Gadhafi were shelling the city of Misrata on Sunday, using tanks, artillery and cannons, a witness said. Rebels in the city were fighting back, the witness said. There was no immediate word on casualties. [6:36 a.m. Sunday ET, 12:36 p.m. in Libya] Nineteen U.S. warplanes, including stealth bombers and fighter jets, conducted strike operations in Libya on Sunday morning. The warplanes included Marine Corps Harrier Jets, Air Force B-2 stealth bombers, and F-15 and F-16 fighter jets, according to Lt. Cmdr. James Stockman of U.S. Africa Command. It is the next phase in the operation that started Saturday with the launch of more than 110 Tomahawk Cruise missiles from U.S. and British warships and subs. [5:40 a.m. Sunday ET, 11:40 a.m. in Libya] In another defiant speech, Libyan leader Moammar Gadhafi promised "a long-drawn war" after international airstrikes in his country by the United States and allies. "You have proven to the world that you are not civilized, that you are terrorists - animals attacking a safe nation that did nothing against you," Gadhafi said in a televised speech. Throughout the address, an image of a golden fist crushing a model plane that said "USA" filled the screen. Gadhafi said the strikes was a confrontation between the Libyan people and "the new Nazis." "If the men are killed, then the women will take over. They will hold the green flag high," he said. [5:35 a.m. Sunday ET, 11:35 a.m. in Libya] An eyewitnesses in Misrata claims there is heavy artillery and tank fire under way in the town. The eyewitness also claims no aircraft have been seen or heard. [5:26 a.m. Sunday ET, 11:26 a.m. in Libya] Libyan TV has announced that Moammar Gadhafi "will address the Libyan people shortly to address the nation concerning the assault of the crusaders against the people of Libya." [1:10 a.m. Sunday ET, 7:10 a.m. in Libya] Fighter jets were seen flying over the Libyan city of Benghazi on Sunday morning. It was not immediately clear who the fighter jets belonged to. China's foreign ministry expressed regret over the military strike on Libya and said it does not agree with use of force in international relations. The Spanish armed forces will send four F-18 planes, a refueling plane, an F-100 frigate, a submarine and a maritime surveillance aircraft to Libya. Venezuelan President Hugo Chavez denounced the military intervention in Libya, and slammed the United States and the United Nations. "They (the U.S.) want to appropriate the oil in Libya; they don't care about anyone's life in that region," he said, according to Venezuelan state media. "When have they cared about the lives in those places if they keep on bombing Iran and Afghanistan?" A defiant Gadhafi said Libya will fight back against undeserved "naked aggression." His military claimed nearly 50 people, including, women, children and clerics, were killed in Saturday evening's attacks. French fighter jets deployed over Libya fired at a military vehicle Saturday, the first strike against Gadhafi's military forces, which earlier attacked the rebel stronghold of Benghazi. U.S. President Barack Obama authorized U.S. military force from Brazil on what happened to be the eighth anniversary of the start of the war in Iraq. I am an African from the Sub Sahara. I am so dissapoointed by the Americans and Western countries about their double standards. Why are they quiete about Yemen and Bahrain? How many people have been killed in Yemen right now? Arabs wake up! I am an African and i don't hesitate to call you STUPID because you are easily manipulated. You back stab each other – not a nation to be trusted at all. Its time for you to unite or the whole Arab countries will be on fire just because of your stupidity. Hey Che, I tend to agree with you on the issue you raise. There is a hidden agenda on the part of those hypocrites and war mongers engaged in trying to kill the leader of another nation. But, it is the love of money, and the capital markets, disguised as so-called democracy, behind the 'freedom fighting' that is at the center of the fire you refer to. This is really a spiritual struggle to establish authority over all civilization. Obama and the European authorities are themselves deceived to involve themselves in this so called 'spring'. It is about getting control over a people that will not play ball with the godless wicked. And, to get their oil and resources. At the same time, those leaders have no idea what the plan of God is. They do not believe God. They will be astonished to find that they are in the wrong. It is a painful situation in Lebya that innocent people are being tatgeted. Latest update is seen on following link. Please go through it. Thank you for your words, Syed. . Of course, you are right. It is a great sin against Libya and the Libyan people, and against their leader that they are trying to kill without conscience. Those leaders are in big trouble with God and all righteous people, who will also condemn the strategy of violence they follow. I don't expect many people to read this 6 days later BUT now where all your smart comments when the Rebel leader has been tied to Al-Qaeda and Obama is fighting along side him. Wow. That's real "freedom" seeking people there guys. Way to go. I don't expect many people to read this 6 days later BUT now where all your smart comments when the Rebel leader has been tied to Al-Qaeda and Obama is fighting along side him. Wow. That's real "freedom" seeking people there guys. Way to go! Thank you for your words, Martha. You are right about this issue. Obama has made a huge error and started something he most certainly should regret. I think other site proprietors should take news.blogs.cnn.com as an model, very clean and excellent user friendly style and design, let alone the content. You are an expert in this topic! And dsobtleus hatred and fear of Gadhafi, when still alive and a threat, united diverse political, social and sectarian elements in Libya.Now he is dead the potential for division increases. Which groups will NATO support and which groups will NATO bomb?